What would it be like to learn you would carry the infinite God within your womb? This ekphrastic poem (fr. 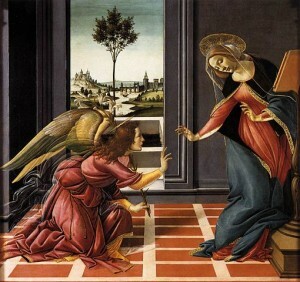 Gk ekphrasis, a rhetorical exercise of describing a work of art) follows Botticelli’s lead in opening up a space of consciousness between Gabriel’s message and Mary’s bold acceptance. The poem is both meditation and art criticism. It interprets the painting, which is itself already an interpretation, and both invite interpretation from the reader. 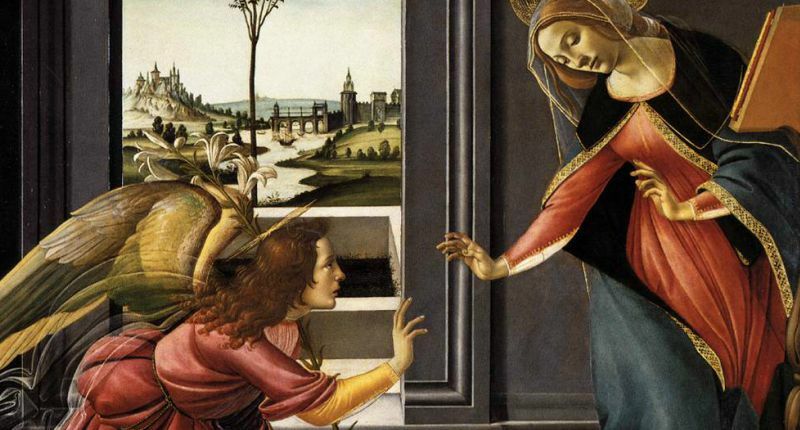 Thus, this poem about a painting about the annunciation of the incarnation participates in our own embodiment through imaginative conversation with other minds. of the angel’s robe. But her whole body pulls away. lets her refuse, accept, refuse, and think again. Andrew Hudgins, in Upholding Mystery: An Anthology of Contemporary Christian Poetry. Ed. David Impasto. Oxford University Press, 1997.